When I first heard of the book, Fault Lines in the Constitution: The Framers, Their Fights, and the Flaws that Affect us Today by Cynthia and Sanford Levinson, I was excited for the opportunity to have a resource that might help explain the intricacies and development of such a historically and presently important document. The authors have written a book that approachably zooms in on issues that foundationally impacted our government from the beginning and effectively highlights how these same issues rise up as challenges today. Without judgment or picking sides of an argument, Cynthia and Sanford Levinson articulate a complex topic in an accessible way for readers young and old. I appreciated the focus and clarity by which the authors explained the nooks and crannies of the Constitution’s formulation as I navigated my way through the text. As a teacher of writers, I found many entry points for students to glean from when looking at variations and characteristics of nonfiction pieces. Here are five tips to use with students within your writing workshop. The book is organized into seven key sections. Each section has between two-four chapters. At the beginning of each section is a summary of the topic and some background information. What’s unique for young writers, is the chance to see narratives leading each following chapter. Stories are told to set up and draw in the reader. I love finding new ways to show students how to weave narrative elements into nonfiction and this book demonstrates this writing move beautifully. Following each story is a heading that consistently starts with Meanwhile, Back in (insert year)… Students are able to see how an author can achieve storytelling elements within nonfiction content. A consistent feature of the text are quotes that support the previous point. I find, with my third graders, that including quotes can be a difficult task to effectively pull off. Each chapter is full of quotes breaking up sections of the information. I’m eager to share these elements as mentors for including quotes when my students and I break into research writing. Titles can be an invitation to our readers. 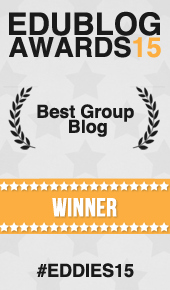 Ask any of us at Two Writing Teachers, and we will confess that crafting titles for posts can be difficult. It is equally difficult for our students. This book has masterfully created titles that beg you to continue reading. Encouraging your writers to experiment with titles is so important and with examples like these: Majority Rules–Except When it Doesn’t, It Takes Two to Tango, and Knock Knock. Is Anybody There? we can suddenly share clever titles at our fingertips. Moving a reader through an information piece heavy with research and rich vocabulary is no easy task. When a writer is passionate about a topic, baiting their readers with headings can help keep engagement alive. 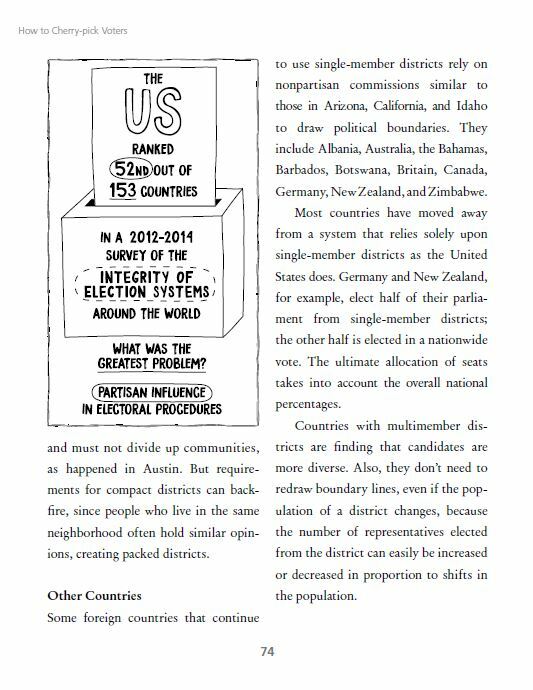 Within each chapter of the book are consistent headings, one that I referenced earlier, Meanwhile, Back in (insert year)… but also So What’s the Big Problem, There Are Other Ways, and The Story Continues. These predictable headings repeat through each chapter and helped move me as a reader through all the information better understanding the issues explained. Anytime we can offer ideas to students to move their reader through a piece we are offering invitations for clearer focus and organization. I always enjoy observing how students will utilize text features within a piece of nonfiction writing. Heavily sprinkled throughout the entire book is every example of a text feature a writing teacher could ask for. Maps, infographics, framed sidebars, captions, labels, charts, graphs, you name it, I bet it’s in there. The powerful part of each feature is that it is in a sketch like format. Students can feel like any feature is approachable and possible. Thinking about how we can visually represent our words for readers is always a fine line. Too detailed and you might lose focus on the purpose of the image, too general and you might lose your reader. Here are two examples below. I would highly recommend adding this chapter book to your classroom library or mentor text bookshelf if you work with students ages eight and up. I only highlighted five suggestions of how it can inspire and move your writers but the possibilities abound! If you are interested in winning a copy of Fault Lines in the Constitution: The Framers, Their Fights, and the Flaws that Affect us Today by Cynthia and Sanford Levinson see the giveaway information below. 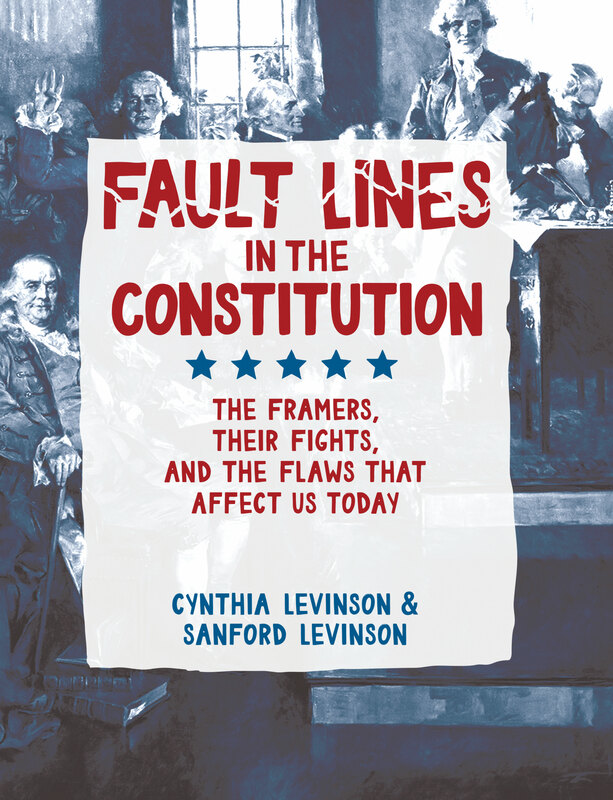 This giveaway is for a copy of Fault Lines in the Constitution: The Framers, Their Fights, and the Flaws that Affect us Today by Cynthia and Sanford Levinson. Many thanks to Peachtree Publishers for donating a copy to one reader. For a chance to win this copy please leave a comment on this post by Thursday, September 28th at 11:59 p.m. EST. I’ll use a random number generator to pick the winner, whose name I will announce at the bottom of this post, Monday, October 2nd. If you are the winner of the book, I will email you with the subject line of TWO WRITING TEACHERS – FAULT LINES. Please respond to my e-mail with your mailing address within five days of receipt. Unfortunately, a new winner will be chosen if a response isn’t received within five days of the giveaway announcement. I would love to get my hands on this book! Looks like a fabulous resource! I’d love to read this book! It sounds like a great read and an engaging mentor text! I love examples of using narrative to hook readers in informational text. I’m so excited about this book! I’ve been looking for something like this to add to my classroom library. What a timely topic and conversation! Thanks for sharing some of the ways to use it. This book would be a wonderful addition to our library! My students need this book! So many possibilities! I have a student who would love this book!! This sounds great! I’d loved to share with my class. This sounds like a real gem! Thanks for spotlighting this great resource! Thanks for giving an offer to win a copy of this exciting new book. It sounds great. Sounds like a must have book for my personal library!! Thanks for sharing information about this book! I have lots of great nonfiction picture books, but am still working on building my library of longer informational texts. This sounds like a good one to have, both for reading and for writing (and social studies, too). Thanks so much for all the valuable information! I would love a book! I’m very interested in reading this book, Fault Lines in the Constitution. I would love to be selected as the winner! Always looking for new mentor texts. A fascinating and timely post. It is critical students understand the foundation of our democracy. What a bonus to have a book about the Constitution as a mento text for non-fiction writing. This book looks like a terrific resource to share with my 5th graders. Pick me! Thank you for highlighting this important new book. I’ve heard a lot about it and I’m always eager to find new nonfiction mentor texts. As a political junkie who LOVES teaching the Constitution to 8th graders, I am so interested in reading this book to help me understand the document further…thus my students will also. Sounds like a very interesting book. There’s certainly things I could learn. Thank you for highlighting this book. It is difficult to find kid friendly books about the constitution. It also has a ton of writing crafts which makes it a perfect mentor book for writing. I enjoy your suggestions on how to use the book. I will share the information with the teachers in my building. I will add this book to our library. So excited about this book! Sounds perfect for my students for this year’s National History Day. I’ve been looking for a resource like this for my 6th grade workshops. Thanks! Thank you so much for all the amazing ideas supporting writing in the classroom. This is my first year teaching the 4th grade and preparing our TX students for the writing STAAR. We are getting ready to begin discussion of how to write expository text and this post has generated a ton of ideas for me! I would Love to won this book and use it to help my students become stronger authors! This book will be a great resource as a organizational mentor of non-fiction texts and also the content is especially important and relevant. Students need to understand the Framers intent and our collective duty to uphold it. This will be great to use in our 7th grade classrooms where they have to pass the Constitution test!! This is an exciting book at a perfect time. I would love to have a better understanding of the nuances and intricacies of some of the things that are dividing us. This looks like a wonderful resource and a timely one as well. Thanks for highlighting some examples of how to use it to support nonfiction writers in our classrooms. I’d love a chance to win a copy!